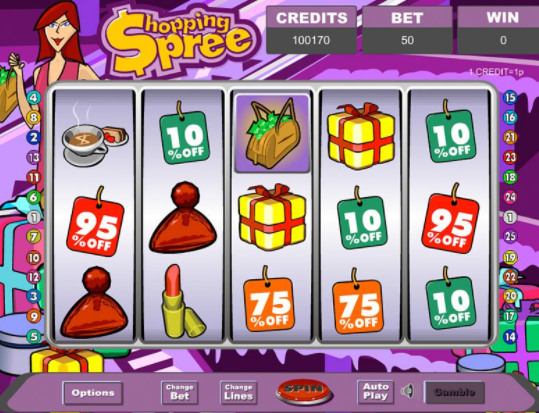 If you love shopping and also trying your hand at 5 reel new online slots then shopping spree is the game for you. There's an enormous 25 paylines in this shopaholic’s paradise so spin the wheel and it could be you winning some high-end bargains. This title was developed and published by EyeCon, an Australian company that delivers great titles to the casino gaming market since 1997. 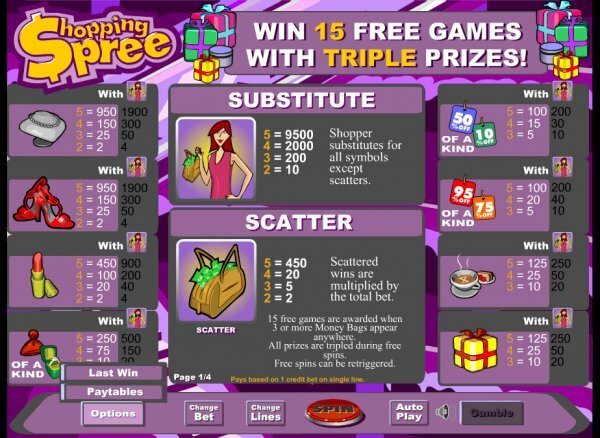 Slot games like Shopping Spree are what made them famous in the digital gaming sector, with over 100 titles in their portfolio, all of them being designed for entertainment, with stunning graphics and top-notch gameplay and animations. Getting you to enjoy every single spin is their focus, as this game-development company has invested a lot in highly-skilled professionals specialized in 2D and 3D graphics. This game delivers a high level of entertainment within a clear, concise and crisp design. If you would like to read more about various promotions with this game then click here. We all have dreams and secret wishes, don’t we? Well I guess, one of them is common for everyone. Being able to shop around for countless hours with a countless budget. How fantastic would it be? It is not a matter of wishing and dreaming anymore, since you have the power of the action to make your dreams come true, with Shopping Spree, a slot game that has no limit in you winning tremendous prizes and offers thrilling multiplier values up to 9500x your stake. I know, that’s enough for any dream to come alive. It is all up to you or your personal shopper, as the game also has an auto-spin feature, where you can sit, watch and win as the computer does the job for you! easy game. This 5 reels, 25 pay-lines title is designed for you to enjoy that happy feeling of a shopping session, coming with a mall-themed interface; with a pink background that has the reels laid on, containing the following elements: a woman*the main character), 10% off sign, 25%off sign, 50%off sign, 75%off sign, a coffee cup, a cake, a handbag, a necklace, shoes, a present and a lipstick. Near the reel's frame, on the left-hand side, there’s a lovely red-headed lady with a lot of shopping bags, all dressed up fancy and trendy. She displays all your shopping dreams, and no wonder if you will be just like her after playing Shopping Spree, given the amazing bonuses this game features. 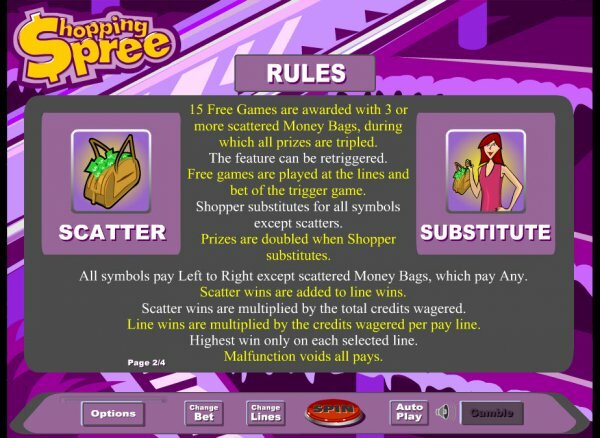 Free spins, wilds and scatters await you in this amazing shopping trip. Land on at least 3 handbags and you can get up to 15 free spins, that can bring you further wins as, during the free spins mode, all the earnings are worth triple value. You can now pay with phone credit slots! Meet the red-headed woman as you spin the reels and you are in for a real treat, as she can make your dreams come true. Land of 5 lady symbols and you will get 9,500x times your stake. That’s so WILD! So what are you waiting for?! This is your once in a lifetime chance to live your dream and earn a fortune with this tremendously generous slot game title from EyeCon. When the shopping fever hits, there’s nothing you can do but spend your money for the bundle of joy that you get buying whatever comes to your mind. That is how we felt playing Shopping Spree slot game from EyeCon, not only it engaged your shopping fever, but saves you from spending, while at the same time letting you earn a fortune if inspiration is on your side. This game is a total eye candy! If you enjoyed Shopping Spree then you might also like Fluffy Favourites slots game. Play today! Discover more games on our homepage.